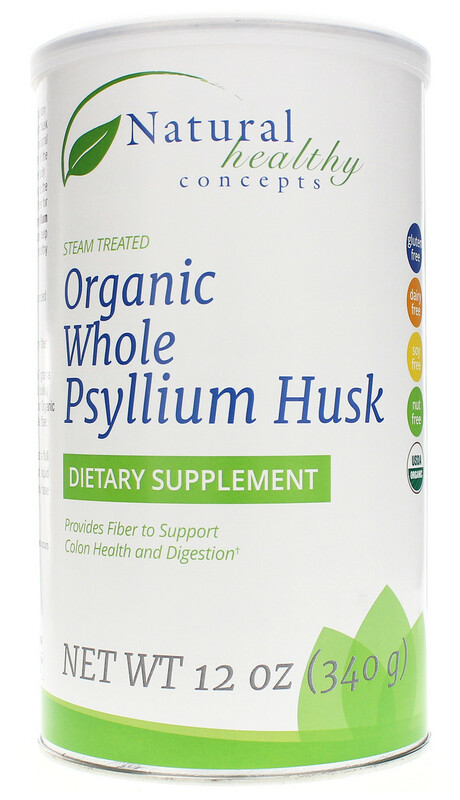 Get Fiber Support from Organic Whole Psyllium Husk. Organic Whole Psyllium Husk from Natural Healthy Concepts is a gentle source of dietary fiber to help ease digestion, colon health, and regular bowel movements.If you don’t get enough natural fiber from the foods in your diet, you may benefit from taking a dietary supplement of steam treated organic psyllium husk, which is a bulk-forming fiber that works as a gentle laxative to cleanse and empty the intestines.By promoting gut health, this supplement seeks to help you maintain optimal regularity and an overall feeling of wellness. Mix it with water, milk, or your favorite juice and drink it one to three times a day. Organic Whole Psyllium Husk Product Details. Good source of fiber.Promotes healthy digestion. Supports colon health. Supports bowel regularity. Supports a low carbohydrate diet. May support heart health. May support cholesterol levels already in the normal range. Blend with juice, water, or milk. Suitable for vegans. Try Organic Whole Psyllium Husk from Natural Healthy Concepts today! It may make a difference to your health! Serving Directions As a dietary supplement, add 2 heaping teaspoons of Organic Whole Psyllium Husk to 10 to 12 ounces of juice, water or milk, one to three times daily. Mix well by stirring, blending or shaking and drink immediately. Begin usage gradually to allow your system to adjust to the increase of fiber in your diet. Precautions Warning: This product should be consumed with at least a full glass of liquid. Consuming this product without enough liquid may cause choking. Do not consume this product if you have difficulty in swallowing. If you are pregnant or nursing, please consult your healthcare professional before using this product. Keep out of the reach of children.